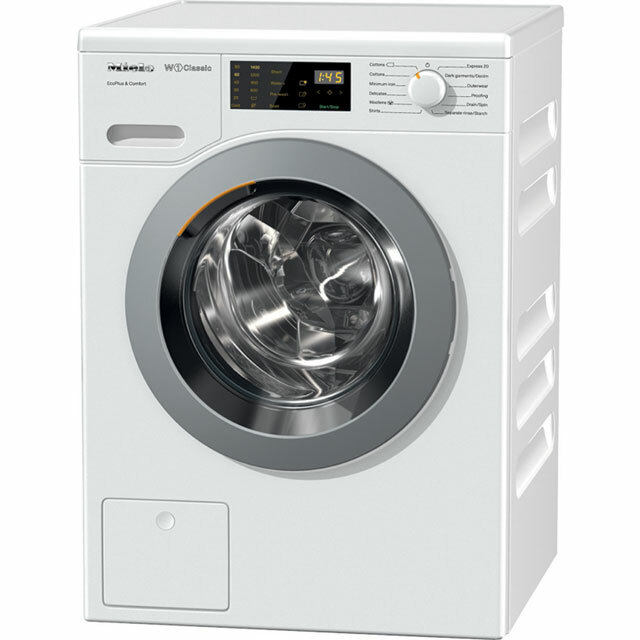 Give your clothes a superior clean with this Miele washing machine. With a 7kg drum, it’s an ideal model for busy, medium-sized households. Each item is given specialist care too, thanks to the clever CapDosing system. This uses tailor-made detergent capsules, which are dispensed at the perfect time, to keep clothes looking as good as new. The handy 20 minute quick wash leaves clothes spotless in no time, which is great when you need your favourite shirt in a hurry, and the incredibly quiet ProfiEco Motor makes this model great for open plan living. This washing machine has also been tested for the equivalent of 20 years’ use, so you know it’s built to last. Because Miele’s appliances are tested for the equivalent of 20 years’ use, you can trust that you’re getting a durable and reliable machine. Every product is put through its paces, making sure it can wash for 10,000 hours – that’s 5 washes per week for 20 years. So, you’re guaranteed to get an appliance that’s truly designed to last. Even if your fabrics need specialist treatment, Miele’s CapDosing system gives your outfits the best care. Whether you’re washing your gym gear, woolly jumpers or silk shirts, simply choose a Miele capsule to match the load. These capsules contain the exact amount of detergent, specialist detergent, fabric softener or booster needed to look after the fabrics. And, because they’re released into the drum at just the right time, they’ll always give perfect results. With Miele’s ProfiEco motor, this model works hard to leave your laundry spotless, but makes little noise doing it. Because the motor uses frictionless magnets to power the appliance, it’s much quieter than other motors, which use brushes. This means that the washing machine is durable and reliable, and you’ll barely notice it’s there – in fact, it’s so quiet that it’s perfect for use in open plan homes. Miele's honeycomb drum provides the gentlest care for your fabrics. The smooth sculpted surface creates a fine film of water during the cycle which cushions clothes, allowing them to glide effortlessly. The honeycomb design has smaller holes compared to a standard drum too, so your outfits won’t get caught or tangled. I haven’t put the machine through it’s paces yet but so far it’s been really great & I’m glad to have settled on this brand & model after much deliberation. I was hesitant about buying this as it is Miele’s entry level machine, and my last one was from the top end of AEG’s range. However, I had been told by several people that with Miele you can’t go wrong. They were right! This is miles ahead of my old machine - everything about it is better. It is so incredibly easy to use. I love the washing results I get from it. The 20 minute wash is handy for freshening things up. If you want a full wash then it takes 2 and a half hours - yes that’s quite a long time, but it’s very thorough and you see that in the results of your washing. If you’re doing delicates and you press the “quick” button then that will take it down to about an hour which I find good. Pressing the quick button for a cottons wash takes it down to about 2 hours which is perfectly fine for me. The machine is very easy to use and it is silent! The only thing you can hear is the laundry tumbling about - you can’t hear a thing from the motor of the machine! One thing I will point out is that this model doesn’t have a delay start facility - this didn’t affect my 5 star rating as I don’t need that facility. However some people might want to consider going to the next model up which I believe does have that facility. Good quality washing machine but the regular programmes are extremely long. It’s either 20 mins for a fast wash or nearly 3 hours for a normal wash with nothing in between. Machine arrive and installed with no issues, easy to operate and has more than enough options for what we need. my only gripe would be if they recommend a capsule for tablets then why not supply one. other than that is is quiet efficient and an excellent replacement for the 15 year old Miele it has replaced. Great machine, easy to use and lovely to look at.